Investing in CenturyLink (CTL), the struggling regional telecom company, has not gone well for investors over the last few years. Since peaking in late 2014, CenturyLink's stock is down about 55%, and even accounting for its double-digit yield, investors have seen total returns of about -35%. After years of struggling with a declining legacy landline business (see negative sales growth from 2013 through 2016 below), CenturyLink announced a game-changing acquisition. In 2017 the firm bought Level 3 Communications for $34 billion, with hopes of pivoting the company into fast-growing and thriving businesses like fiber optics and enterprise services. The addition of Level 3 Communications' growing businesses was intended to return CenturyLink to positive revenue, earnings, and free cash flow growth, thus providing more sustainable coverage for its generous dividend. However, CenturyLink's latest earnings sent the stock plunging 12% and caused research firm Cowen to cut its 2019 revenue and EBITDA expectations. Let's take a look at CenturyLink's latest results to see what they might mean for dividend investors going forward. The cornerstone of CenturyLink's problems has been the secular decline in landlines, which has been going on for more than a decade. At the end of 2017 CenturyLink still had more than 10 million landline phone connections, and this business accounted for close to 30% of company-wide revenue. CenturyLink's solution to this problem was to acquire various regional telecom rivals, spending more than $25 billion on acquisitions since 2008 (not counting the Level 3 merger). As merger synergies failed to play out as expected and core end markets remained in decline, the firm's debt exploded and ultimately forced the company to cut its dividend by 26% in 2013. However, since that dividend cut CenturyLink's earnings and cash flow have continued to suffer, resulting in dangerous payout ratios that have put the company's payout on thin ice. The Level 3 acquisition was sold to investors as a permanent solution to CenturyLink's profitable growth problems for three reasons. First, the combined company believed it could achieve $850 million per year in cost savings (synergies) in 2018 and another $1 billion over the long term. That would potentially boost free cash flow significantly and lower CenturyLink's free cash flow payout ratio to a more sustainable level of 56% in 2018. Next, buying Level 3 would enhance CenturyLink's long-term growth profile thanks to its 450,000 miles of fiber optic cables that will presumably be in high demand when the country transitions to 5G. In addition, CenturyLink would become the second-largest enterprise telecom services provider (for corporations), second only to AT&T (T) and larger than Verizon (VZ). Finally, Level 3 CEO Jeff Storey would become COO of the larger company, and Level 3 CFO Sunit Patel would take over that important role for the new and improved CenturyLink. Storey actually recently became CEO, and new and improved management could theoretically help CenturyLink's struggling turnaround efforts via improved capital allocation decisions. So what's gone wrong with CenturyLink's plan to pivot to the future of telecom? 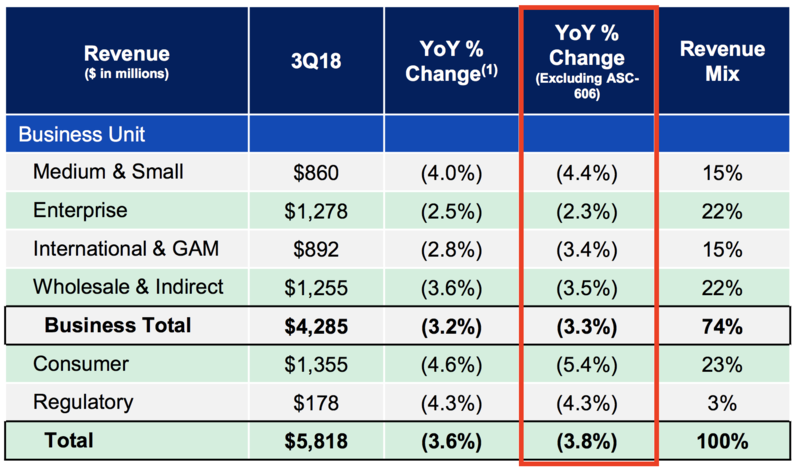 While the legacy landline business continued to see substantial sales declines (as expected), CenturyLink also reported revenue declines in every single business unit, even its larger enterprise and fiber units. After the Level 3 merger, these strategic areas now account for about 75% of revenue. Management has communicated that the company is willing to forego some revenue growth to focus on only profitable expansion opportunities, which is a positive (margins expanded last quarter), but CenturyLink's poor track record makes it hard to feel comforted by these top line results. Plus, if these new strategic areas were so attractive, one would think profitable growth opportunities would abound. Why are CenturyLink's most promising business units struggling? 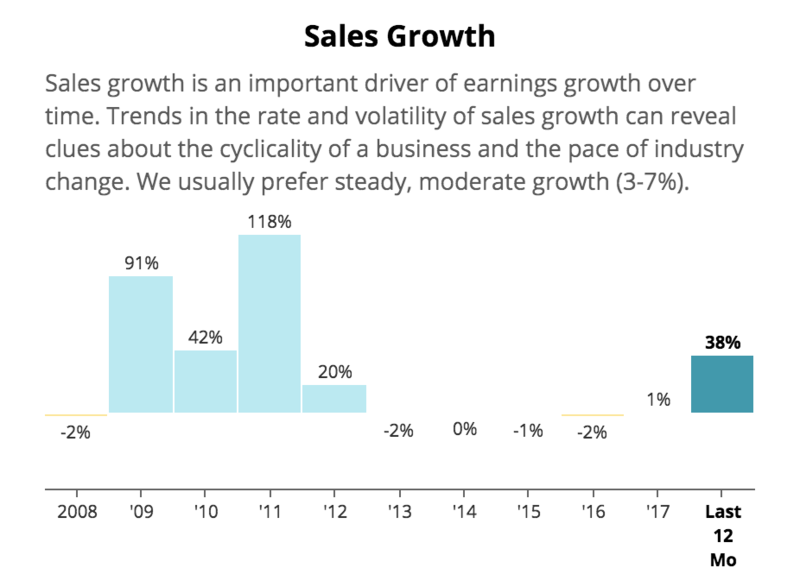 Simply put, overcapacity and large rivals (like AT&T and Verizon) are limiting the growth potential of the company's most important business lines. CenturyLink has essentially no pricing power in these businesses, which is why some analysts expect that the fiber and enterprise services businesses will see only modest sales growth over the long term. Unfortunately, progress in those markets seems likely to be swamped by CenturyLink's deteriorating consumer business (cable TV and landlines), which fell over 5% in the third quarter and continues to account for more than 20% of company-wide revenue. Even CenturyLink's consumer broadband internet division, which should be theoretically impervious to cord cutting (you can't stream without fast internet service), is gradually losing subscribers. However, there was actually some good news, as far as income investors are concerned about short-term dividend safety. Management revised its 2018 capex budget down from 16% of revenue to just 13%. As a result, the company now expects free cash flow to come in $400 million higher than previously expected. CenturyLink is selling this change as management's efforts to be more disciplined on the capital allocation front by reducing investment into the firm's declining copper landline business in order to focus more on fiber. "We put in place a capital governance process comprised of senior leaders of the company to ensure all investments are in line with business and financial objectives. The financial rigor and discipline led to several decisions to redirect investments. One example is our decision to minimize investment in our copper based plant for the consumer business.However, we are ramping up investments in our fiber footprint for consumer to complement our micro targeting strategy." When combined with the $850 million in cost savings from synergies (which the company is on track to achieve), CenturyLink's free cash flow should come in at about $1.8 billion above its dividend cost, good for a full year free cash flow payout ratio of 56%. So if the company's dividend is well covered by free cash flow, and management plans to permanently lower spending on declining landline businesses, then why did the stock fall off a cliff? Despite an improved payout ratio, CenturyLink's dividend remains risky. CenturyLink's dividend remains on shaky ground in part because the firm's revenue continues to shrink. Even the larger enterprise services business and fiber optic units are seeing declines, which is very disappointing given that the company was betting all its future growth on these industries of the future. And while CenturyLink's free cash flow is going to come in ahead of expectations this year, the improvement is due entirely to less investment into declining businesses rather than sustained growth in strategically important areas of the business. The market wasn't impressed, as demonstrated by the plunge in CTL's stock price after it reported results. There is only so much cost cutting a telecom can realistically do, which means that if CenturyLink can't began growing its top line, then free cash flow will likely once more start to erode starting in 2019 and beyond. As a result, the telecom's free cash flow payout ratio could climb steadily higher, eventually imperiling the dividend. CenturyLink's business has very high fixed costs given the amount of infrastructure involved to provide various telecom services, so declines in revenue hit earnings and cash flow especially hard. But with an expected 56% free cash flow payout ratio in 2018, doesn't CenturyLink have many years before the dividend comes under threat again? Not necessarily. If CenturyLink's balance sheet was in great shape, then yes, even with moderate declines in revenue and cash flow, the business could still generate enough money to comfortably maintain its dividend while also investing to revitalize growth. Unfortunately, CenturyLink has a huge amount of debt after a decade of spending over $60 billion on acquisitions (that have yet to restore it to positive revenue growth). Management must use free cash flow to pay down debt in addition to doling out dividends, which are much more discretionary in nature. Today CenturyLink's total debt stands at about $36.5 billion, and its net debt to EBITDA ratio remains uncomfortably high following the firm's acquisition of Level 3 Communications. As a result, CenturyLink has a junk bond credit rating of BB and pays a steep average interest rate of 5.8% on its loans. Fortunately, CenturyLink has no debt maturing before 2020, reducing immediate liquidity concerns, but between 2020 and 2022 the company has $10 billion in long-term bonds coming due. With under $400 million in cash on hand and less than $2 billion in retained free cash flow after paying dividends, CenturyLink will need to refinance the vast majority of those maturities unless it can rapidly increase its growth rate, which it has proven unable to do so far. The trouble is that refinancing its already expensive bonds might prove even more costly in a rising interest rate environment. According to Moody's, even investment grade corporate borrowing costs have risen by 100 basis points since long-term interest rates bottomed in mid-2016. Junk bond yields are rising even faster, climbing about 150 basis points in that time according to S&P (for BB rated debt). What this effectively means for CenturyLink dividend investors is that, while the dividend is technically sustainable in 2018 and likely 2019, by 2020 the company could be facing significant refinancing challenges that might force it to cut the dividend yet again. And if the firm's growth prospects continue to dim, putting downward pressure on free cash flow, management may feel a greater level of urgency to pay down more debt sooner rather than later. With CenturyLink's dividend consuming about $2.2 billion of cash each year, it would be an easy and significant source of funds to free up. CenturyLink's high dividend has been maintained for five years now, despite the regional telecom's struggles with falling sales, earnings, and free cash flow. The 2018 acquisition of Level 3 Communications was supposed to restore the company to growth, thanks to strong fiber optic and enterprise service businesses that would make it far less reliant on its declining consumer segments. However, while the cost savings management promised are coming in as planned, the revenue growth the merger was supposed to deliver has not. Unfortunately, due to strong competition in those relatively better businesses, CenturyLink's overall revenue and free cash flow outlook remains poor. A sharp cut in capex this year has dropped the firm's free cash flow payout ratio to safer levels, but CenturyLink's mountain of high-cost debt still puts the dividend at risk of a cut in 2019 or 2020. That's unless CenturyLink can suddenly start delivering much higher revenue growth, while simultaneously reducing costs even more to help reduce its debt without the need for another payout cut. Such a rosy scenario is appearing less likely given the firm's latest results. Overall, CenturyLink remains a challenged business with no meaningful competitive advantages. 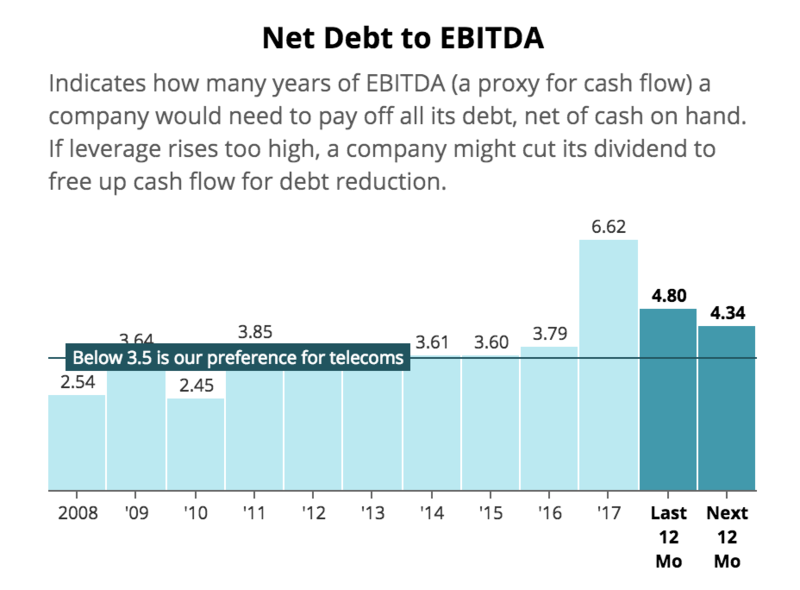 While some telecom companies can be reliable cash cows, the firm's high debt load, shrinking revenue base, and history of poor capital allocation decisions make it a much more speculative dividend stock that conservative investors should avoid.